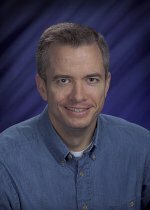 Congratulations to Dr. Kevin Rosso at Pacific Northwest National Laboratory on receiving the Best Paper from a National Laboratory Award at the 2009 U.S. Department of Energy Basic Energy Sciences Geosciences Symposium. The symposium brought together 50+ U.S. experts in geosciences and related fields to discuss ongoing and future research. Every year, the symposium's committee of observers awards two best paper awards: one to a national laboratory researcher and one to a university researcher. The award-winning paper Rosso presented was on redox transformations of the iron oxide hematite. Rosso showed that under certain conditions interfacial electron transfer can couple to bulk conduction of electrons yielding transformation to unique crystal morphologies. These results with iron oxide are relevant to water quality, corrosion science, soil evolution, and environmental cleanup. Rosso is active in the scientific community, having authored or co-authored 90+ peer-reviewed journal articles and book chapters. He is a frequent speaker at universities and international symposia. In addition, he is a life fellow of the Mineralogical Society of America and a member of the Geochemical Society and the American Chemical Society. The symposium was held March 12-13, 2009, in Annapolis, Maryland.